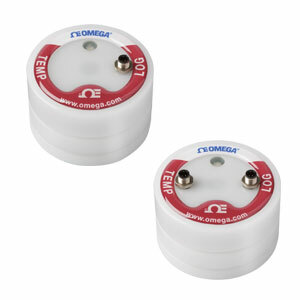 The OMYL-T11 and OMYL-T12 are temperature data loggers with internal temperature sensor that also accept external temperature inputs. These data loggers are available with standard memory of 100,000 readings (OMYL-T11, OMYL-T12) or expanded memory of 4 million readings (OMYL-T11-4M, OMYL-T12-4M). The following inputs can be configured: • Internal temperature • External temperature (Pt100/Pt1000 RTD, Type U thermistor) The storage medium is non-volatile flash memory so no data is lost if the battery becomes discharged. Data logger setup as well as data retrieval is accomplished using the included standard OMYL-SOFT software. Downloaded data is stored in the OMYL-SOFT software as a text file for viewing in third party software packages or Microsoft Excel. The OMYL-SOFT standard software does not include any graphing functionality. Graphing and analyzing downloaded data files requires the OMYL-SOFT-PLUS version of the software (sold separately). Nota: Comes complete with 3V lithium battery (standard temperature range), 1.8 m (6') USB interface cable, OMYL-SOFT software and operator’s manual on USB stick.